This septic system inspection article explains where to look for and how to locate septic system components for any purpose such as inspection, maintenance, troubleshooting or repair, or as part of the Septic Loading and Dye Test procedure for testing the function of septic systems. 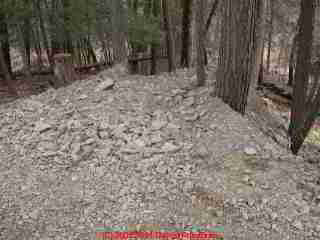 Our page top photo shows a recently-created pile of rocky soil pushed against trees and over the "septic tank" location at a rural property. This act of burying the septic tank right before the inspection raised an immediate concern about just what was installed at the property. The failed soil absorption system (drainfield) for this system was promptly found simply by climbing over this rock-pile and looking over the edge of the hill. More photos of this troubled septic system and places to look for septic system components are described below. Possible Septic Tank Locations: what are the likely locations for a septic tank? See SEPTIC TANK, HOW TO FIND for details of how to find the septic tank. See SEPTIC TANK LOCATION SKETCH for examples of how people may have made a record of where to find the septic tank at a property. Shared septic systems What are all of the possible locations for a tank on the property? Perhaps there is essentially none, or room for a tank but no absorption system. Do not assume that all septic components are even on the property. Some older properties were built with shared septic systems, or individual tanks and a shared leach field. Later owners may never have been told that their leach field was on a neighbor's property, and vice versa. See SEPTIC DRAINFIELD LOCATION for detailed procedures for finding the septic drainfield or leaching bed (also called soakaway field) at a property. Space for septic fields? Is there even room for a conventional tank and drainfield at this property? If the property is too small it is unlikely to have a septic tank and drainfield but it might be using a cesspool. Beware: a "grand fathered" cesspool or other non-conforming septic system at a property may not be permitted to continue in use in that form when septic repair is needed. Are there site encumbrances likely to make installation or replacement of the septic system difficult or costly, such as nearby streams or lakes, storm drains, trees, rocky or steep site conditions (see our septic failure case examples), or limited distances from a well or property boundary? Remember to check nearby streams and lakes during and after the dye test. Are there pipes extending from the property into a nearby stream, possibly discharging septage? The site shown in this photo was all that was available to place a septic system. Rocky and steep, a conventional system could not work properly (though special steep slope septic system designs are available. This system appeared to be in failure before we started our test - we saw water, probably septic effluent running over a rock just below the reported (new) septic tank. Our dye confirmed that it was from the septic system. Here is the same rock ledge with increased effluent flow as soon as we started our septic test. Sewage from this system had been discharging to the surface from an overflow pipe or from the bottom of a tiny, home made seepage pit which itself was sitting on solid rock, sending septic effluent running downhill to Wappingers Creek and from there to the Hudson River for decades. We were informed by the agent that the system was in perfect working order but that the owners, simply to improve the "curb appeal" of the property, had just installed a new septic tank. Unfortunately what was needed was an entire steep slope system to handle the effluent. The seller's money was not well spent. These pages are part of our SEPTIC DYE TEST PROCEDURE for testing septic system function. Technical review by industry experts has been performed and is ongoing - reviewers are listed at REFERENCES. Comments and suggestions for content are welcome. Continue reading at SEPTIC DRAINFIELD LOCATION or select a topic from closely-related articles below, or see our complete INDEX to RELATED ARTICLES below. SEPTIC COMPONENT LOCATIONS at InspectApedia.com - online encyclopedia of building & environmental inspection, testing, diagnosis, repair, & problem prevention advice. , Woodson, R. Dodge: $ 24.95; MCGRAW HILL B; TP; Quoting from Amazon's description: For the homebuilder, one mistake in estimating or installing wells and septic systems can cost thousands of dollars. This comprehensive guide filled with case studies can prevent that. Master plumber R. Dodge Woodson packs this reader-friendly guide with guidance and information, including details on new techniques and materials that can economize and expedite jobs and advice on how to avoid mistakes in both estimating and construction. Chapters cover virtually every aspect of wells and septic systems, including on-site evaluations; site limitations; bidding; soil studies, septic designs, and code-related issues; drilled and dug wells, gravel and pipe, chamber-type, and gravity septic systems; pump stations; common problems with well installation; and remedies for poor septic situations. Woodson also discusses ways to increase profits by avoiding cost overruns. Grass is Always Greener Over the Septic Tank, Bombeck, Erma: $ 5.99; FAWCETT; MM; This septic system classic whose title helps avoid intimidating readers new to septic systems, is available new or used at very low prices. It's more entertainment than a serious "how to" book on septic systems design, maintenance, or repair. Not recommended -- DF. Water Wells and Septic Systems Handbook, R. Dodge Woodson. This book is in the upper price range, but is worth the cost for serious septic installers and designers. Quoting Amazon: Each year, thousands upon thousands of Americans install water wells and septic systems on their properties. But with a maze of codes governing their use along with a host of design requirements that ensure their functionality where can someone turn for comprehensive, one-stop guidance? Enter the Water Wells and Septic Systems Handbook from McGraw-Hill. Wells and Septic Systems, Alth, Max and Charlet, Rev. by S. Blackwell Duncan, $ 18.95; Tab Books 1992. We have found this text very useful for conventional well and septic systems design and maintenance --DF. Quoting an Amazon description:Here's all the information you need to build a well or septic system yourself - and save a lot of time, money, and frustration. S. Blackwell Duncan has thoroughly revised and updated this second edition of Wells and Septic Systems to conform to current codes and requirements. He also has expanded this national bestseller to include new material on well and septic installation, water storage and distribution, water treatment, ecological considerations, and septic systems for problem building sites.